**4.5 Stars** Lucas and Fallon are back. 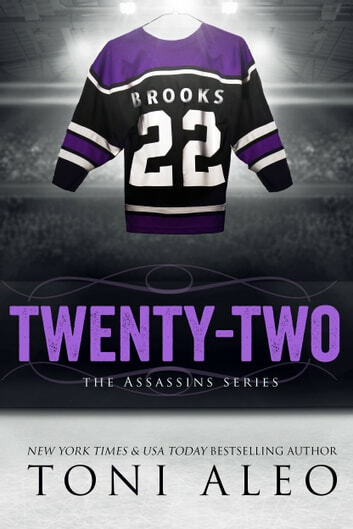 I loved getting this glimpse back into the life of Assassins player #22 Lucas Brooks. I didn't realize how much I missed him and his family until Toni gave us this story. Seeing the original generation Assassins was so much fun. I've loved getting the side stories and more in depth story of Lucas and I hope we get to see more of this with the others. The story shows the life Lucas and Fallon have created for themselves and their family. You get to see what all of the kids are up to and a glimpse of what Aiden's future holds. I hope we get to see more of Aiden's story as well. Toni did an amazing job with this story and I loved being able to reconnect with one of my favorite Assassins! I adored Toni Aleo’s TWENTY-TWO. We heard Lucas Brooks’ and Fallon Parker’s story in the second book of the Assassins series, TRYING TO SCORE. I love that Toni Aleo revisited Lucas’ life towards the end of his career in book 11.5, TWENTY-TWO. I also appreciated, the glimpse of his son, Aiden’s life, as well as the other Assassin’s and their families. Like the other books in the Assassin’s series, this story takes place in Nashville. It is suitable for adults. I have always liked Lucas. He is one of my favorite Assassins. I don’t think I am alone in that regard. He is a dynamic character that you cannot help but respect. Lucas faces several issues in this story. He has to make life-altering decisions. I think it is wonderful how Fallon supports him. Those two have come a long way. They truly love each other. They have a terrific family, their own and their extended Assassin’s clan. I enjoyed the insight into the difficult situations Elli must deal with as the team owner. She is a good friend to the team, but she is still their boss. It is a delicate balance. I think the progression into Lucas’s son; Aiden’s life was perfect. I love that he is being recruited by Bellevue. That is the perfect transition to the Bellevue Bullies series. I’m hoping we are going to hear his story. TWENTY-TWO had a perfect ending. Toni Aleo is an amazing writer. She has done a fantastic job keeping this series fresh and relevant. I always look forward to reading her books. I voluntarily reviewed an advance reader copy of this book. Weer een geweldig verhaal van de pen van toni aleo. Een prachtig verhaal over lucas, fallon en aiden. Loved it. Great little read to reconnect with this adorable family from the Assassins series!! Looking forward to fin out what will happen with their boy!! Now of to Toni Aleo's next book, which should be available sometime this year!